Far from an accident of history, the First World War was a long sought-after event welcomed by European elites as a check against democratization and socialist reforms -- but the war had far-reaching and unexpected consequences. 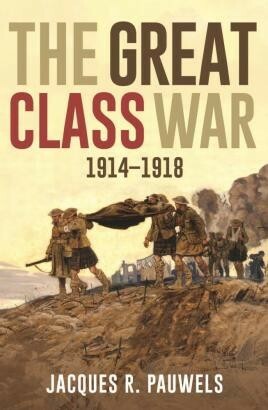 Unfortunately, due to sales rights restrictions, we cannot offer The Great Class War 1914-1918 for sale in your country. Historian Jacques Pauwels applies a critical, revisionist lens to the First World War, offering readers a fresh interpretation that challenges mainstream thinking. As Pauwels sees it, war offered benefits to everyone, across class and national borders. For European statesmen, a large-scale war could give their countries new colonial territories, important to growing capitalist economies. For the wealthy and ruling classes, war served as an antidote to social revolution, encouraging workers to exchange socialism's focus on international solidarity for nationalism's intense militarism. And for the working classes themselves, war provided an outlet for years of systemic militarization -- quite simply, they were hardwired to pick up arms, and to do so eagerly. To Pauwels, the assassination of Archduke Franz Ferdinand in June 1914 -- traditionally upheld by historians as the spark that lit the powder keg -- was not a sufficient cause for war but rather a pretext seized upon by European powers to unleash the kind of war they had desired. But what Europe's elite did not expect or predict was some of the war's outcomes: social revolution and Communist Party rule in Russia, plus a wave of political and social democratic reforms in Western Europe that would have far-reaching consequences. Reflecting his broad research in the voluminous recent literature about the First World War by historians in the leading countries involved in the conflict, Jacques Pauwels has produced an account that challenges readers to rethink their understanding of this key event of twentieth century world history. Pauwels takes an alternative view of the causes of WW1 and the social and political upheavals that followed as a result of the conflict. Fascinating.